You won’t have to travel to Washington, D.C. to see gorgeous Smithsonian Gems when you visit the special exhibit at the Lizzadro Museum of Lapidary Art. Now through Saturday, March 31, the Lizzadro Museum showcases 12 pieces of beautiful, hand-wrought jewelry that incorporate beautiful gems. The items in the exhibit are all on loan from the vaults of the Smithsonian National Museum of Natural History. The work of several American jewelry designers is on display. All of us at Elmhurst Toyota encourage you to see this breathtaking exhibit. Some of the Smithsonian jewelry was created by well-known American designers, including Tiffany and Company and Harry Winston. The pieces of jewelry are all unique and made with stones such as cat’s eye beryl, diamonds, star sapphires, opals and adamantine pearl. 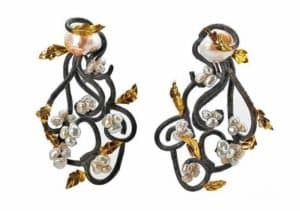 Among the Smithsonian Gems jewelry are a necklace featuring opals from Idaho, a diamond and opal brooch by Colorado designer Susan Helmich, and pearl earrings artfully designed to resemble a pair of wrought iron gates in Charleston, South Carolina. The Lizzadro Museum in an affiliate of the Smithsonian Museum, so it’s able to host various Smithsonian exhibits right here in Elmhurst. The Smithsonian Gems exhibit has been generously supported by funds from the City of Elmhurst’s Explore Elmhurst Community Grant Program. Explore Elmhurst was created to promote community activities and events to the public. Smithsonian Gems will leave Elmhurst at the end of March. You don’t want to miss this opportunity to see this unique and beautiful gemstone jewelry. Tuesday through Thursday, Saturday and Sunday: 11 a.m. to 5 p.m.
Museum members, active Armed Forces members and children under 7 are admitted free. Visit www.lizzadromuseum.org or call 630-833-1616.